If you are gluten free and visiting Edinburgh, you may wish to consider staying at our lovely Westside Balcony Apartment. 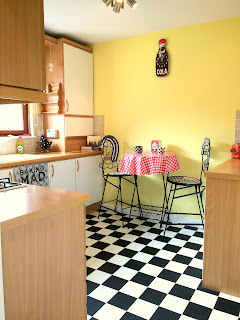 Apart from the fact its a comfortable and bright vacation rental in Edinburgh, and has a fully equipped kitchen for home cooking, we can also provide you with a gluten free toaster (please ask in advance to arrange this - basically a 2nd toaster that we keep for guests with food allergies)! This Edinburgh holiday rental apartment is particularly useful for Coeliacs visiting Edinburgh as its across the road from many stores that have a reasonable range of gluten free food. There's a M&S foodhall which has its gluten free food scattered through the store (look for items in green packaging). A decent fridge range includes such items as gluten free lasagne, gluten free scotch eggs (lovely! ), and there is a separate section for items such as bread and biscuits. Many of their sausages are gluten free too however M&S seem to have less than other stores in their freezer section. The Sainsburys grocery store has a good selection of its gluten free food in one aisle. Look or ask for the 'Free From' section. Both the above stores are 5 minute walk from our Westside Apartment. If you fancy delivery then both Dominos and Pizza Hut in Edinburgh now offer Gluten Free Pizzas, both are very good. Order easily online for delivery. If you are staying at one of our Edinburgh Apartments and require further information on Gluten free eating in Edinburgh then feel free to ask.